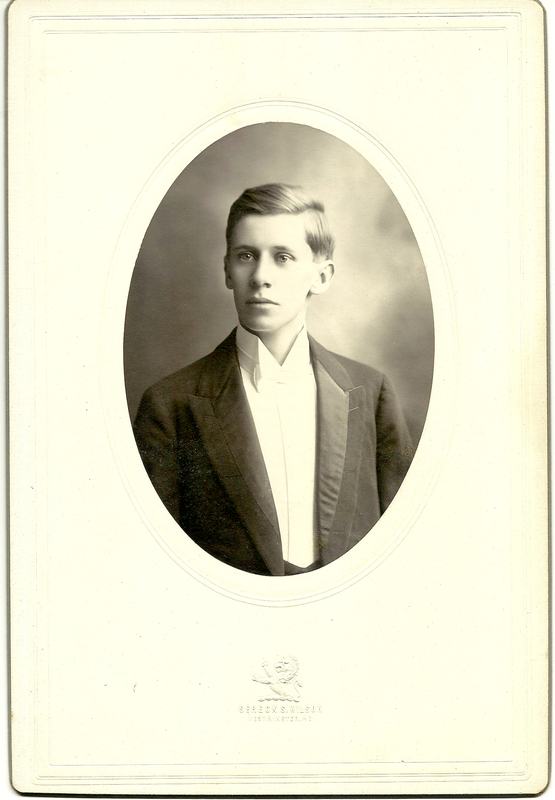 Young John Hunt Hendrickson (1887-1951) had this portrait taken while at school at Western Maryland College, in Westminster, Carroll Co. Md. The operator at Sereck Shalecross Wilson’s (1870-1943) Westminster studio placed the solemn youth against a soft background and lit him from the right to throw his long, straight nose, clear pale skin and wide, expressive mouth into relief. The reverse of the cream card mount with blind embossed lion advertising mark bears an inscription and the year 1907, making Hendrickson about 20 at the time of this photograph. The understated background and restrained, oversized card mount reflect the period’s move away from the visual excesses of the 1880s and 1890s. Wilson took many photographs for Western Maryland College year books; examples can be found in the digital archives of Western Maryland College. The Carroll County Times also has a few of his portraits on its website. After graduation, his father, John David Hendreickson, prosperous owner of The Model, a dry goods store in Frederick, sent him to Harvard Law School. At Harvard, he told a Portland, Oregon reporter in 1947, not knowing where he would end up locating, he took very little law, and soaked up all the operas, plays, lectures and concerts that he could. With a poor showing at law school, Hendrickson decided to go west. He went to Portland, Oregon, where his first job was with the firm Veazie & Veazie, run by Oregon natives Arthur Lyle Veazie (1868-1941) and J. Clarence Veazie, whose forebears, the Lyles, Scotts and Veazies, and settled in Oregon in the 1840s, ’50s and ’60s. Hendrickson had deep roots in Frederick County, Maryland. His great-grandfather, weaver and farmer John Hendrickson (1801-1982), was born in the Johnsville district of that county. One strong thread of the family’s story is the move from country to town, from farm labor to store owner to educated professional. Judge Hendrickson’s father was brought up to hard farm work, but left that life to become a clerk in a store at the age of 16. Then, after having bought the store and made it one of the most successful in Frederick, J. D. Hendrickson sent two of his three sons to college and took the third, Russell Ames Hendrickson (1891-1968), into his business. J. D. Hendrickson’s third son, Caroll Henshaw Hendrickson (1892-1971), attended Cornell University and ultimately joined his brother Russell in the family firm. In Portland, John Hunt Hendrickson found his calling as a legal educator and a judge. He began teaching commercial law to bankers in 1913, then became an instructor and eventually dean of Northwestern College of Law until 1943. He was elected a district court judge in 1926 and held that position with the high respect of his peers until, wheelchair-bound from multiple schlerosis, he retired from the bench in 1947. The circa 1820 brick and stone home where he grew up, at 119 West Second Street, in Frederick, still stands, as does the building where his father and then his brothers operated what became Hendrickson’s Department Store until the 1970s. Judge Hendrickson died on 28 June 1951. He is most likely entombed with his wife, Winifred Birrell Hendrickson, at Riverview Abbey Mausoleum and Crematory, Portland, Oregon. The home where they brought up their two sons, Ames Birrell Hendrickson and John H. Hendrickson Jr., stands very much the same at 2821 South West Upper Drive. The Frederick County Historical Society has a number of early Hendrickson family photos on display on its website.